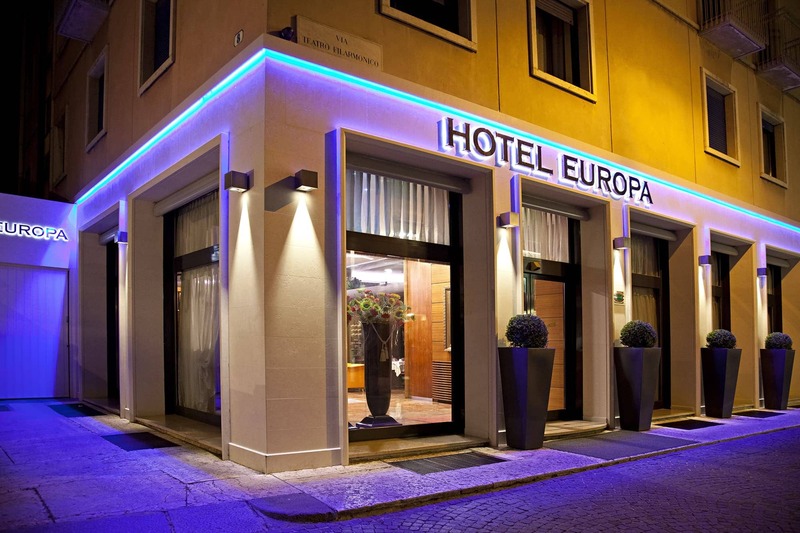 Hotel Europa in Verona, a refined and very comfortable 3-star Hotel, is the ideal solution for any type of stay. Thanks to the strategic location, the Hotel is situated in the historical centre of Verona at few metres from the Arena, where every year the largest opera festival in the world is performed and important music concerts take place. The Hotel is located in beautiful Roma Street, which is a pedestrian street connecting the magic Bra square with Castel Vecchio, a magnificent monument on the river Adige. The Hotel is opposite the Filarmonico Theatre (with its important lyric and concert season); a few metres from Palazzo Gran Guardia centre of congresses and temporary exhibitions. Hotel Europa can be reached by car without any restriction and owns an internal garage. It is surrounded by bars, restaurants, shops which will make your stay even more pleasant. For any further information don’t hesitate to contact us.